The odds are that this was a very popular series. It combined a number of motifs popular with the buying public in Edo: actors portraying magical figures. 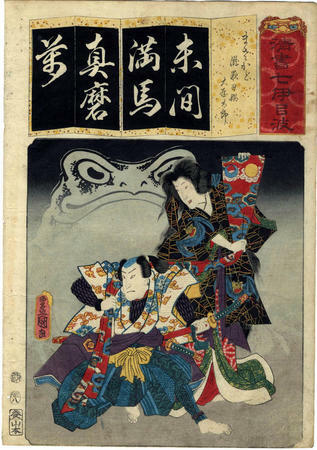 We know of at least three different editions of this print because of the two copies in the National Diet Library collection and the one featured here. One has the giant toad, which dominates the background, appearing mysteriously out of a grey and black haze. The foreground ground is printed in a slightly deeper shade of gray. The other example is exactly the same in every way except the toad and background have a distinctive bluish tint with a green ground in front. The print in the Lyon Collection, it would seem, represents a third variation with a somewhat bluish-gray toad and atmosphere and a gray ground.